Unzip the package to a folder of your choice. The folder contains a subfolder Lib which contains the precompiled DCU eg. 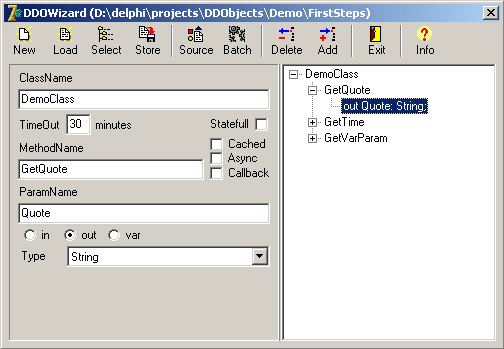 OBJ files for each supported version of Delphi and C++ Builder. Add the appropiate folder to your library path and install the contained package dclDDObjects within your IDE selecting Component|Install Packages. A new tabsheet labelled DDObjects, containing six new components, should appear. If you have any problems in proceeding these steps, check your library- as well as your windows searchpath which should include the directory containing the package files. Select File|New|Other, select the tabsheet labelled ‘DDObjects’ and doubleclick on the contained icon (DDOWizard) to run the integrated wizard. Within that wizard, provide an appropiate name to be used for the classname (we’ll assume the name ‘DemoClass’ as an example) and add these methods along with their parameters and types as shown in the following screenshot. Leave the checkboxes labelled ‘Stateful’, ‘Cached’, ‘Callback and ‘Async’ unchecked and don’t change the value for ‘TimeOut’. These settings are not relevant at the moment and will be discussed in an advanced tutorial. Select a directory where this information (expressed in XML) and the generated sources should be stored. Generating the sources is as easy as clicking a button. Click on the corresponding button and wait a few seconds. You’ll be notified as soon as the wizard has completed its task. The wizard will generate two units whose names will depend on the classname: uDemoClass_Proxy.pas will be included within the client, while uDemoClass_Stub.pas will be included within the server. These units contain the classes that implement the previously defined interface. Let’s start creating the server. This is not much more complicated than creating the client. However, advanced issues and scenarios dealing with multi-threading can be a challenging subject of their own. Although the server does use several threads to perform its task, this tutorial does not deal with these issues. Open the unit uDemoClass_Stub.pas and locate the following snippet of code. Note that the class inherits from the abstract class TDemoClass_Stub which is defined and (partly) implemented within the same unit. Copy the provided code to the form unit, press CTRL+C to perform code completion, and implement the methods as appropiate. Note that instead of overriding the constructor, the class offers a virtual method called Initialize which should be used instead. Once a client calls the method GetQuote on the proxy (as shown in the client code above), the call will be sent over the network, received by the DDOListener component, forwarded to the implementation in TDemoClass and finally sent back to the client which receives the result. You do not need to implement any specific code for this, as it happens automatically. // The "+1" causes an exception to be raised from time to time. // This is intentional to show how DDObjects handles exceptions. Build both projects and start both the client and the server application. If both applications run on the same machine and port 6666 is available, you can start immediately as those are the default settings. Otherwise you need to select an appropiate port within the server application and configure host and port within the client application accordingly. Start the server by clicking the appropiate button. The server contains a simple form which offers some basic logging facilities, showing the requests and results as they happen. Note that this slows the application down, so you can turn logging off. 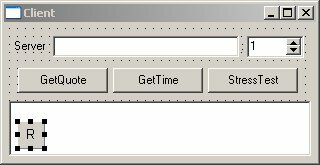 The client application contains several buttons, which will call the corresponding methods of the proxy and show the receive resuls within a memo.